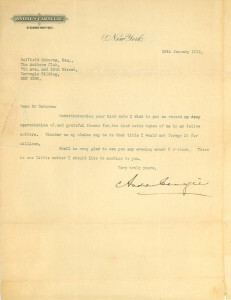 Scottish-born American industrialist; merged Carnegie Steel Co. with United States Steel Corp.
Typewritten Letter Signed, one page, quarto, New York, January 24, 1913. On his name-imprinted stationery, to Duffield Osborne, a representative of the Authors Club. A poor Scottish lad, who immigrated to America with his family as a child, Andrew Carnegie took seriously that America was the land of opportunity. Certainly it was for him. With his capacity, willingness for hard work, perseverance and alertness, Carnegie saw opportunity everywhere. As a telegraph messenger boy in Pittsburgh, he took advantage of the fact that on Saturday nights, a wealthy local businessman opened his 400 volume personal library to working boys. Carnegie was a regular borrower and, getting to know the owner, learned how to make small, then eventually larger, investments. Moving into railroads, the first big businesses in America, then steel, amassing a fortune as he went, Carnegie looked forward to the day (which finally arrived when he was sixty-six years old) when he would retire and use his business talents in other areas, such as philanthropy. Like the venture capitalists of today, Carnegie sought a fresh approach to philanthropic endeavors. For example, in establishing public libraries throughout the United States (commonly called Carnegie libraries), he agreed to build and equip the library only on the condition that the local authority match that by providing the land and a budget for operation and maintenance. In all, he funded some 3,000 libraries in the U.S., Canada, the United Kingdom, and other countries. He took the lead not only in library philanthropy but also in library design, consulting with librarians on what their actual needs were rather than imposing a paternalistic monument. While written in a flattering style, this letter expresses a genuine sentiment. Carnegie was a self-made in education as he was in business. He befriended authors, taught himself journalism by writing endlessly to newspapers, and wrote books and articles on the responsibilities of wealth. He enjoyed the company of literary people and was proud to be considered one of them. 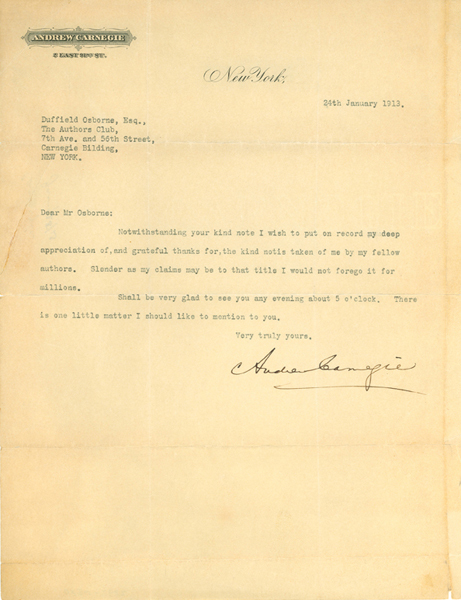 Note that Andrew Carnegie’s unusual spelling is deliberate for he was an advocate of spelling reform. Unframed; we can frame this piece for you.